December is not a popular time to go to Italy. While most tourists flock to the country in the summer, I believe the best time to visit can be the off-season: winter. If you can deal with the chilly weather, you'll enjoy less crowds, no long queues, and not sweating every time you step outside. In Florence, it is impossible to walk more than two meters without stumbling upon some new sculpture or painting. When the weather becomes unbearable, escape the cold by popping in to a museum. Not just any museum, but one of the most renown in the entire world! Every guide book will warn you that trying to enter Uffizi Gallery without a reservation will result in two days of waiting in line. On the contrary, I just waltzed right in! This art gallery holds frescoes by Giotto, canvases by Botticelli and sculptures by Leonardo da Vinci and Michelangelo. My favorite was The Birth of Venus by Botticelli. The entry fee was 12.50 euros. These two chapels were built as extensions to the Basilica of San Lorenzo around the 16th century, as a way to celebrate the Medici family. Unfortunately, when I visited, it was half covered in scaffolding - there was restoration work being executed due to a pebble dropping from the ceiling. 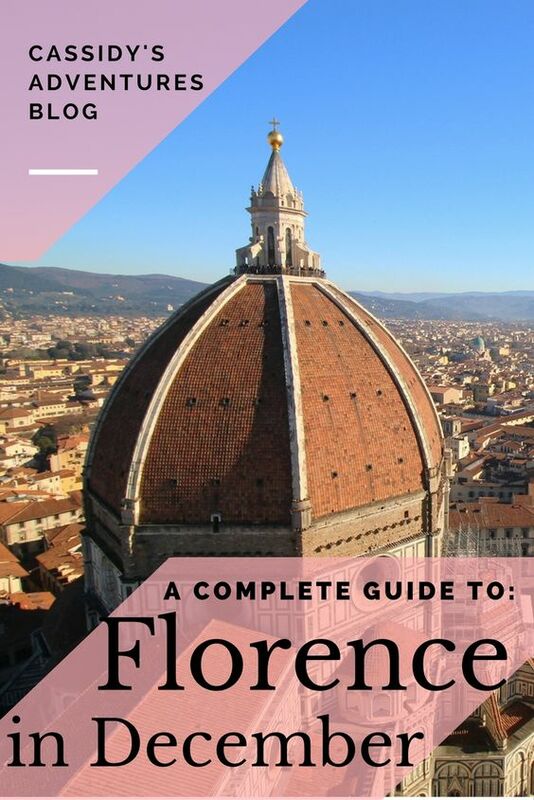 Florence’s main basilica is designed in the Gothic style (built 1296 - 1436), but it also has green and pink marble details on the exterior. Generally, it is open in winter from 10:00 am until 4:30 pm. While it is possible to climb to the top of the dome (duomo), this required a reservation. Instead, I climbed to the top of the the bell tower (campanile). This proved to be the better option because when I finished climbing all 414 steps, I was able to actually see the dome. Giotto's Campanile was designed in 1334 AD. It has seven bells, which all sound a different note! The combined entry fee for the church, the duomo, and the campanile was fifteen euros. This square was the first public forum in Florence during ancient Roman times. Today, the square has a few restaurants, a merry-go-round, artisanal art stands, and a few benches to sit and people watch. When I visited, I was enamored by a group of musicians playing Christmas music. A few couples were dancing nearby and the atmosphere was magical. During my visit, I stumbled across a few street artists. They were just painting with chalk while sitting in the middle of the road. It was so strange, yet at the same time, they were talented. If you visit Florence, keep an eye out for this street art. My favorite part of Florence in December is the Weihnachstsmarkt. This Christmas market is located in Piazza Santa Croce and is open from the 30th of November until the 18th of December. From 10 am to 10 pm the piazza is filled with rustic wooden stalls, representing different countries in Europe. While I was told that this market was a "German Christmas Market" I was surprised to find that it had food from Austria, soap from France, Matryoshka nesting dolls from Russia, nutella filled donuts from Italy, Belgian waffles, and of course pretzels from Germany. For just 3.50 euros, I bought a steamy cup of vin brulée, or mulled wine. I had tried it for the first time last winter in Poland and had been thinking about it ever since. This sweet drink is a mixture of red wine, honey or sugar, nutmeg and cinnamon, and occasionally fruit or extra alcohol. Markets are my favorite part of living in Europe. There is just something so special about strolling around a place that sells the best of that culture - the art, the gifts, the food. There is a cheery bustle of people and the ovens from the stalls warm you from the winter weather. It's like a 3D window shopping experience. I'm pretty sure I would love the markets too, for the same reasons. It would be great to be able to walk through and really experience a place in that way, with it's people simply being what they are. I'd still love to see the Chapels and Gallery though, too!